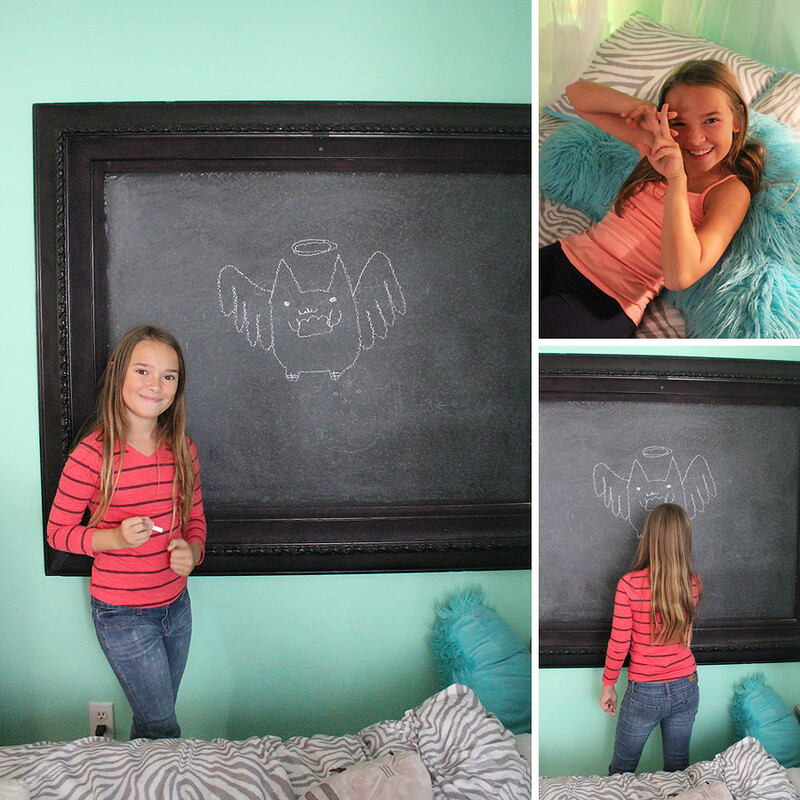 Bug Gets a Chalkboard in her Room. From time to time I like to rearrange things in my house and purge out all the unnecessary flotsam and jetsam that gets piled up without anyone really noticing it. This past weekend Bug got her turn. 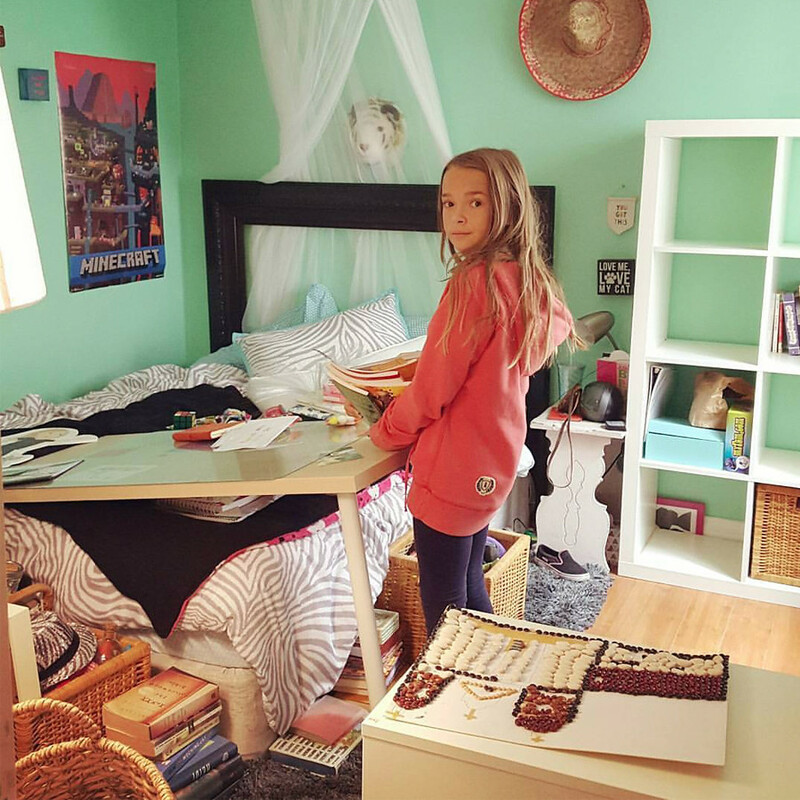 I’ve been nagging her to clean up her room but it always seemed to be impossible for her because she never has enough room to put everything. You know what that means! Add on another room? Nope! It’s time to purge because there must be a place for everything and everything must be in it’s place. I am so much fun that way. So we decided to rearrange! 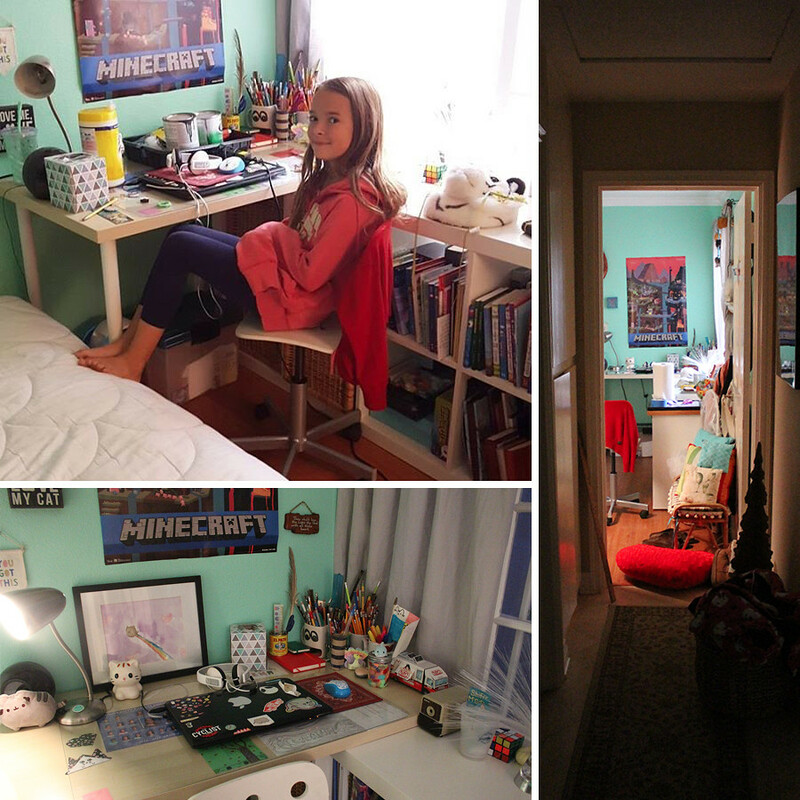 She’s really into gaming and she does her homework in her room now with her computer so she needed more desk space. We needed to make a little office in her room so we did what we always do: we flipped the expedit bookcase! It was vertical (see below). Now it’s horizontal! And since space is tight we put her desk on top of the expedit bookcase, creating a tiny little nook with some slide-around work space to the side of her. It’s tight but super functional. Especially since we moved the rug over that was seriously hindering her chair-sliding mobility. Then, since we were fixing things, we decided to take the old frame that used to be Bug’s faux headboard (That thing has nine lives.) and make it into a chalkboard, which is something she’s wanted since day one. It was really cool as a headboard but unfortunately it was never bolted in correctly and every time the bed got pushed up against it too hard, it would wedge out dangerously. It was just kind of a pain in the head. 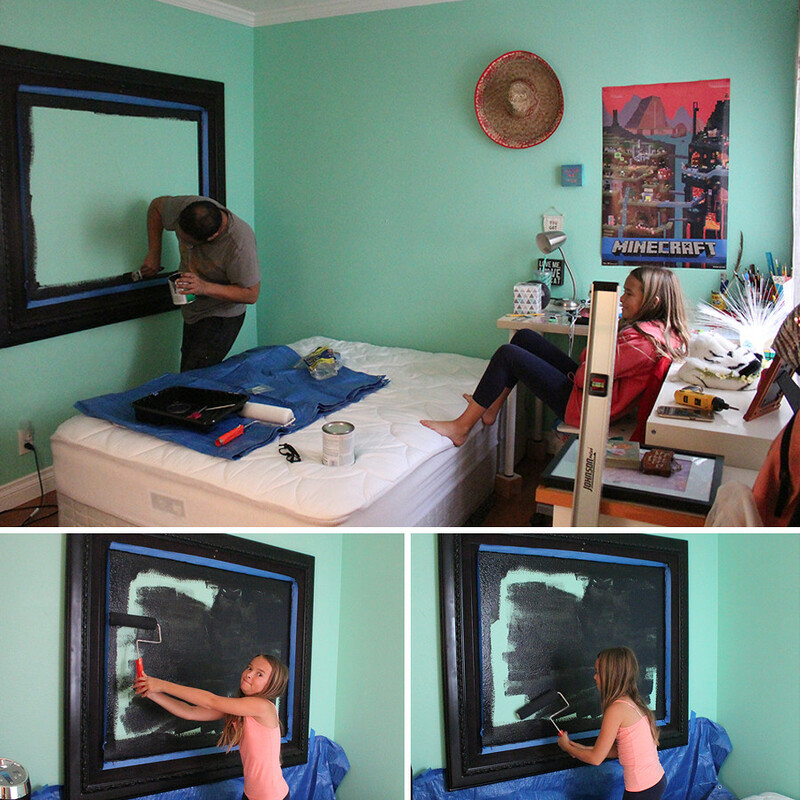 We had bought the chalkboard paint way back when we first painted Bug’s room but we ended up not using it because we were worried about chalk dust and it just looked weird painting a square randomly on the wall. Now, however, we had this big picture frame just sitting around waiting for a new use so we decided to use it to frame in the chalkboard. We’re still worried about chalk dust but using this frame kind of keeps the dust contained a little. Bug can just wipe the bottom of the frame with a damp cloth instead of her floor and bed which is much easier. Payam bolted the frame into studs in the wall so it really won’t budge and then Bug and Payam got busy with the black chalkboard paint. We waited a day for the paint to cure properly and then Bug primed it with a layer of chalk. It wasn’t as much work as I was worried it would be. 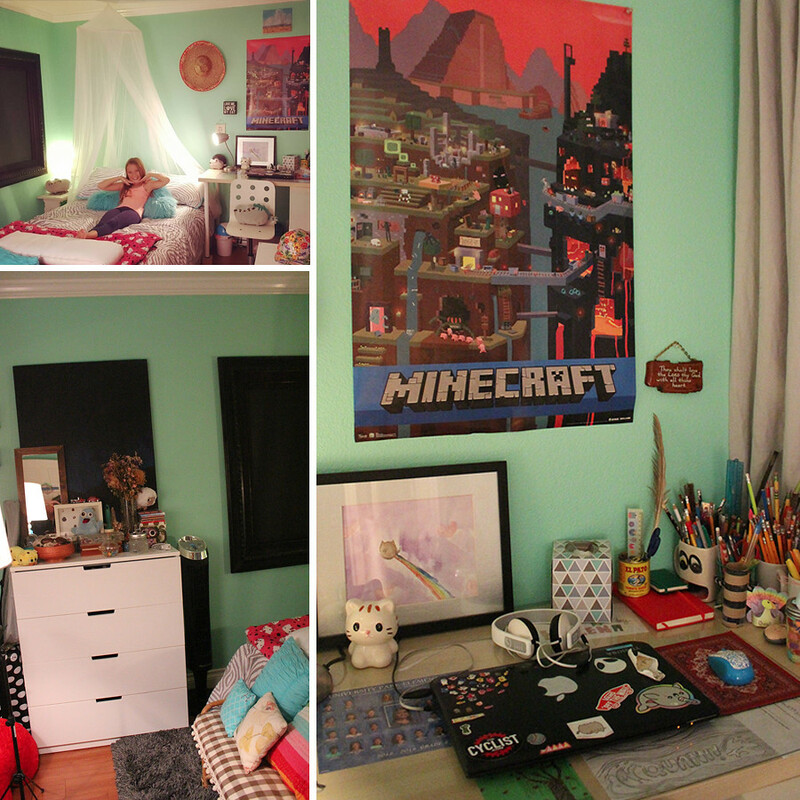 Now her room is much tidier (we got rid of a ton of out-grown clothes and books that she doesn’t read) and it looks a tiny bit better. She still has a ton of stuff but what can you do with a ten-year-old pack rat? Actually, she has gotten so much better at throwing stuff out. She used to be super attached to anything that had a face, no matter what it was. Now she at least can pass things on to people she knows will appreciate them as much as she did. That’s that! Bug is happy as a clam with her new chalkboard! Now it’s time to make one for Joon. A while back I volunteered to organize a dance at Bug’s school. Why I’m on the PTA in the first place is a good question but you know the answer to that. It’s because I’m a fool! I never meant to be politically involved in school matters, I just wanted to help out with graphics and stuff. What can I say? I love a good makeover and Bug’s school was badly needing in the graphics department. Next thing I knew, I had a title and I have to show up to meetings every month. It’s okay though. It’s actually pretty fun. I mean, how could I possibly turn down planning a 50’s-themed sock hop? What a dream job! First thing I did was break out the mettaprints. It’s good to work for a cardboard company because I can design anything I want for half the price. I wanted to make hearts and records out of cardboard and then hang them like dangly decorations. This would have taken forever if I did it by hand so having mettaprints do all the cardboad cutting saved me a TON of time. I could have had them print the records and hearts too but that took away from the homemade feeling and would have substantially cost more. So I painted them myself with help from another PTA mom. (Thanks Maria!!) We had a ton of fun. I think the fact that I never got to go to school dances when I was a kid probably influenced my level of involvement on this. I had big prom-sized dreams. I know, it’s just an elementary school dance but those dreams paid off! How cool do these dangling decorations look all hung up in the multipurpose room at school? It’s like the movie, Carrie. But without pigs blood. Yes, painting all those hearts and records took two days and many messes and I had to tie them all together with little bits of red yarn while I watched Bug play soccer (I’m sure the other parents thought I was nuts.) but it was worth it! When I looked out over the kids dancing to Chuck Berry, it felt like I was back in time. Even Elvis showed up!! It was really hard to talk one of the dads into dressing up but Maria’s husband saved the day at the eleventh hour and he was soooooo good! Our Elvis could dance! Then everybody rushed him for photos. Even the principal! So that’s how I contribute to the PTA. I might not be solving any big core curriculum problems or balancing budgets but I am making things more photogenic!